An avid birder and eminent ornithologist, Arthur Cleveland Bent was born in Taunton, Massachusetts, on November 25, 1866. After receiving his A.B. from Harvard in 1889, bent was employed as an agent for the Safety Pocket Company and from 1900 to 1914, he was General Manager of Mason Machine Works. His passion, however, was birds. 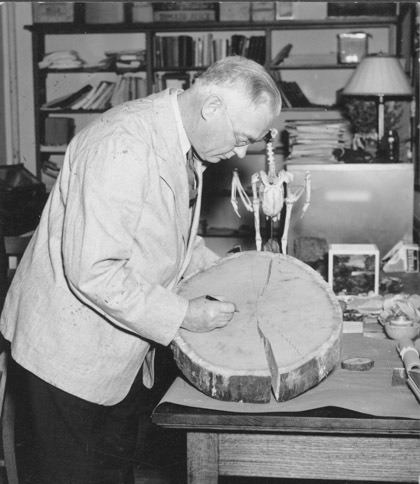 An associate in Ornithology at the Museum of Comparative Zoology at Harvard University, Bent became a collaborator at the Smithsonian and president (1935-1937) of the American Ornithologists’ Union. The culmination of his research was the massive, 26 volume Life Histories of North American Birds (1919-1968). The Bent collection is a glimpse into the birding life of a remarkable amateur ornithologist. It contains the field notebooks of his collaborator, Owen Durfee (1880-1909), his own journals (1887-1942), photographs and negatives (1896-1930), correspondence concerning the photographs (1925-1946), and mimeographed and printed material. 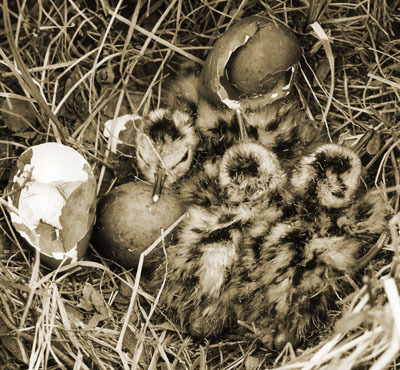 Bent’s records cover nest observations, egg measurements, bird sightings, and notes on specimens provided to organizations such as the Massachusetts Audubon Society, the Bristol County Agricultural School, and the United States National Museum. An attorney from Hadley, Mass., Alexandra D. Dawson was known throughout New England for her work in conservation law and environmental activism. Born in Maryland in 1931, Dawson married shortly after graduating from Barnard College and after raising a family of three, she resumed her education, earning a law degree from Harvard in 1966. Early in her legal career, she took up the cause of protecting “wildlife, wetlands, and woodlands.” She was among the earliest employees of the Conservation Law Foundation and later served as general counsel for the Metropolitan Area Planning Council. The author of a string of influential works in environmental law, including Environmental Law (1978), Land-Use Planning and the Law (1982), and the Environmental Handbook for Massachusetts Conservation Commissioners (1978-2006), she was also an educator, teaching at Antioch College (where she launched the environmental studies program), Tufts, the Kennedy School of Government, and Rhode Island School of Design. 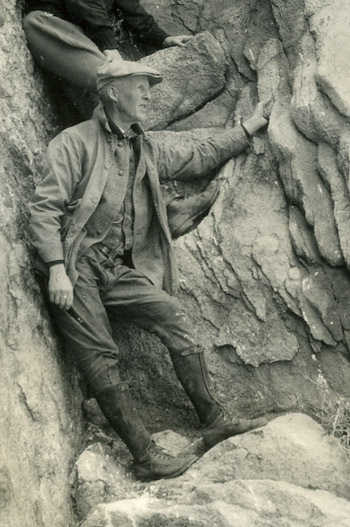 Among other commitments, Dawson was a key figure in the Kestrel Trust and served long stints on the Massachusetts Association of Conservation Commissions (MACC) and the Hadley Conservation Commission. Dawson died of complication from emphysema on Dec. 30, 2011. The product of a forty year commitment to conservationism, Dawson’s papers provide valuable documentation of land preservation efforts in New England, with a focus on the evolution of the legal context. Dawson was a formidable figure in efforts to protect wetlands, agricultural land, and open space, and her papers offer insight into land use planning, her teaching, writing, and speaking. A writer, poet, and environmental and historic preservation advocate, David K. Leff worked for many years as an agricultural and environmental policy adviser to the Connecticut legislature and as deputy commissioner of the Connecticut Department of Environmental Protection. A graduate of UMass Amherst (BA 1975) and the University of Connecticut School of Law (1978), Leff began writing and lecturing from early in his career and in addition to publishing dozens of magazine articles and serving as a regular contributor to the Hartford Courant, he has written five works of non-fiction, The Last Undiscovered Place (2004), Deep Travel: In Thoreau’s Wake on the Concord and Merrimack (2009), Hidden in Plain Sight (2012), Maple Sugaring (2015), and Canoeing Maine’s Legendary Allagash (2016); three books of poetry Price of Water (2008), Depth of Field (2010), and Tinker’s Damn (2013), and a novel in verse, Finding the Last Hungry Heart (2014). Leff has been active as a lecturer and instructor on various topics, ranging from the environment to local history and writing. In 2016, he was named the first Poet-in-Residence of the New England Trail. In addition to containing a nearly comprehensive collection of the published writings of David Leff, the collection includes selected correspondence, unpublished poetry and short stories, a draft of an unpublished novel (Hungry Heart), talks, interviews, notes, newsclippings, over 400 pages of interviews with sugarmakers that Leff conducted for his book on maple sugaring, and selected materials relating to Leff’s work with the DEP in Connecticut and other endeavors. The collection also includes several thousand photographs (mostly digital) takenby Leff and used to illustrate his publications and lectures. Founded in 1995, by founder and former executive director Mark Sommer, the Mainstream Media Project (MMP) was a nonprofit public education organization focused on print and broadcast media about creative approaches in achieving peace, security, and sustainability in an interdependent global community. Until its closing in early 2014, it was particularly involved with placing top policy analysts, social innovators, and on-the-ground organizers on radio and television stations across the country and globe. One such project, A World of Possibilities radio show, founded in 2001, was an award-winning one hour weekly show hosted by Sommer. A program “of spirited global conversations,” featuring interviews searching for understanding of, and solutions to, longstanding global public affairs challenges, A World of Possibilities was nationally and internationally syndicated until it ceased broadcasting in 2011. The MMP Records contain over ten linear feet of CD and DVD masters of uncut interviews and produced radio shows. Shows, including Heart of the Matter and A World of Possibilities, explore promising new thinking and experimentation in fields ranging from energy, food, water, and wilderness to human rights, global security, and public health, and include interviews with leading experts and innovators, such as Studs Terkel, Pete Seeger, Laurie Garrett, Wangari Maathai, Frances Moore Lappe, Howard Gardner, Lily Yeh, Robert Reich, Majora Carter, Van Jones and many more. The collection also contains MMP business files, consisting of correspondence, reports, articles, grant information, and organizational materials. George Naughton was born in 1951 into an academically inclined family. His father, Thomas, was a writer and magazine editor and his mother a music teacher; his grandfather Julius Seelye Bixler was a college professor and president of Colby College (1942-1960); and his great-great-grandfather Julius Seelye served as the fifth president of Amherst College (1876-1890). Naughton grew up in the 1960s in Old Saybrook, Conn. He graduated from Mount Hermon School in 1969 and from New College in Sarasota, Fla., with a BA in General Studies, in 1973. For the next few years, Naughton lived, worked, and meditated in Cambridge, Mass., and California, then in March of 1978 moved to Amherst and took a job at UMass. From 1978 until his retirement in 2011, he worked in University Information Systems in Whitmore Administration Building. Now president of the Amherst Historical Society, Naughton is also active in the Pelham Historical Society and lives in Pelham with his wife, Cindy. Naughton’s lifelong interests have included mathematics, science fiction, cultural alternatives, and books, and he accumulated a wide collection of print material on a variety of topics. 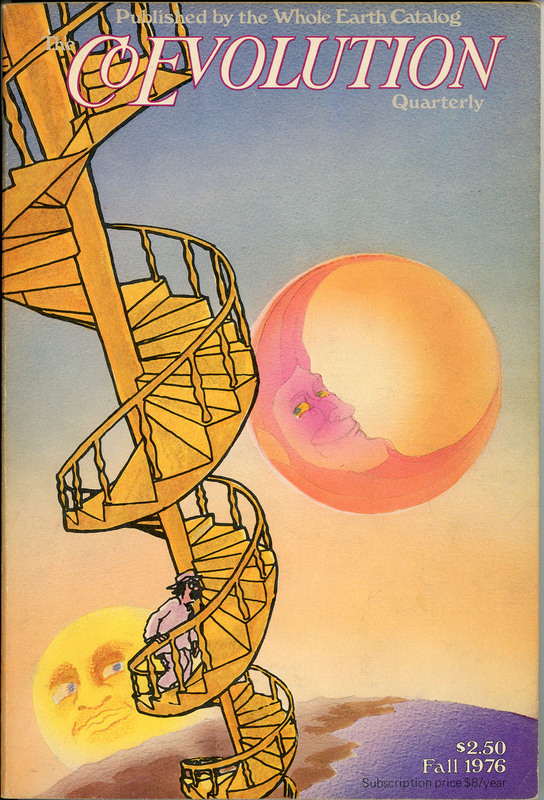 The Naughton Collection is a reflection of many of those interests and comprises underground comics as well as pamphlets, periodicals, and ephemera on spirituality, new age thinking, counterculture, politics, the environment and sustainability, and intentional communities. The abundant waterfowl at Oldham Pond, Plymouth County, Mass., has long been a lure for hunters. During the nineteenth century, both hunting and recreational shooting of geese and ducks grew in scope throughout the Commonwealth, with the development of at least two formal hunting camps at Oldham. The Oldham Camp records contains a detailed tally of waterfowl shot at Oldham Pond, along with an “Ancient history of Oldham Pond” by Otis Foster, 1906, chronicling changes in hunting practices and the advent of blinds and decoys. These records include annual summaries of geese taken at the camp (1876-1895) and summaries of both geese and ducks (1896-1919). More valuable are detailed records of “daily bags,” 1905-1915, providing daily kill totals for each species (primarily ducks). An addendum by Edgar Jocelyn, 1927, provides additional historical detail on the hunting stands at Oldham Pond and changes in methods of attracting ducks. There are, as well, narrative annual summaries of the hunting seasons, 1905-1908 and 1912. Tipped into the front of the volume is a typed letter from the renowned Cope Cod decoy maker A. Elmer Crowell (1852-1951), July 2, 1926, reminiscing about hunting at Wenham Lake and promising to begin work on the decoys. Co-founded by Madeleine Charney, Lena Fletcher, and Kris Nelson, Talking Truth began as a workshop on climate activism held during the Fall of 2015. The original workshop focused on the overwhelming nature of the climate crisis and provided a three part discussion aimed at helping UMass Amherst students, faculty, and librarians find their individual voices as activists and to support collaboration among UMass community members in their efforts to combat climate change. The discussion included a letter writing activity asking writers to share their feelings about climate change. This activity originated in Fletcher’s Natural Resources Conservation course, “Environment and Society” and more letters were written at subsequent Talking Truth events. Through 2018, Talking Truth held a variety of other events including film screenings, author talks, and a booth at the Amherst, Mass. Sustainability Festival. The Talking Truth Collection consists of letters written during Talking Truth workshops, events, and in Lena Fletcher’s classes. 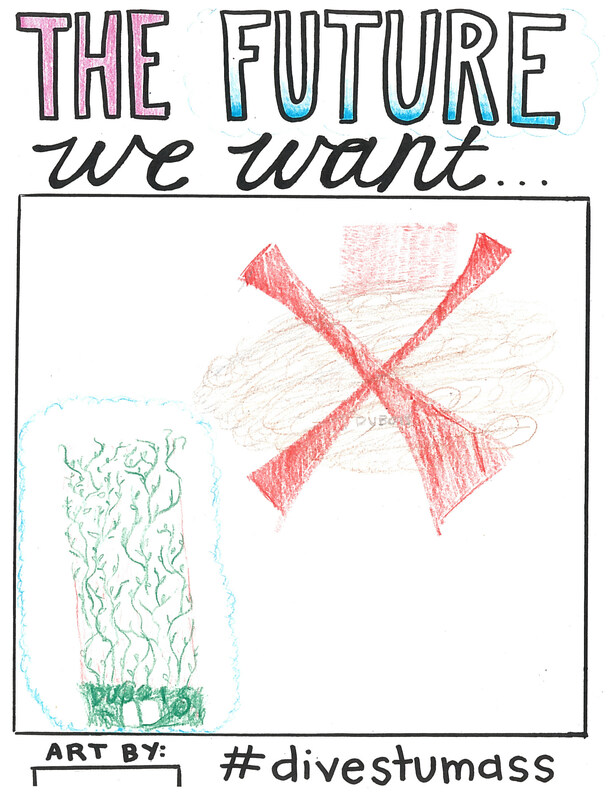 There is also a small group of drawings done as part of the “Teach-in, freak out: building power in a climate of urgency” on November 19th, 2015, which was sponsored by the UMass Fossil Fuel Divestment Campaign. William “Cap’n Bill” Vinal was the first instructor in nature education at Massachusetts State College and a pioneer in the field. A graduate of Bridgewater State (1904), Harvard (MA 1907) and Brown (PhD, 1922), Vinal worked for several years as a camp director on his native Cape Cod and held a variety of university appointments in nature education before joining the faculty at Massachusetts State College as Professor of Nature Education in the Nature Guide School in 1937. Spontaneous in the classroom and field, enthusiastic, and highly popular with his students, Vinal taught courses in conservation, outdoor leadership, outdoor recreation, and nature guiding, and was an important figure in the Massachusetts Audubon Society, the American Camping Association, the Camp Directors Association, and several conservation groups. After retiring from UMass in 1951, Vinal returned to his home in Norwell, Mass., remaining active as a nature writer and teacher until his death in 1973. A valuable glimpse into the early growth of nature and conservation education, the Vinal collection includes dozens of scarce publications by the exceptionally prolific Cap’n Bill, along with a small quantity of correspondence, talks, and reports. As a collection, these document the origin and growth of the Nature Guide School and the program in nature recreation at MSC and UMass, and more generally the growth of nature, recreation, and conservation education in New England. Of local interest is an extensive report for the town of Amherst Recreation Survey Committee (1948) regarding recreational opportunities for youth. Nearly half of the collection consists of an extensive run of Vinal’s quirky, self-published Nature Guide Newsletter (1935-1951).